Find hotel near Punta Borinquen Lighthous ..
Punta Borinquen Light or locally known as Faro de Punta Borinquen is a famous lighthouse which is situated in the Ramey Air Force Base in Aguadilla, Puerto Rico. The station constructed in 1889 by the Government of Spain. The opening of the Panama Canal in 1914 ensured that the lighthouse would become a significant navigation route from Europe to Panama. The original structure of the lighthouse was damaged badly by the earthquake which struck in 1918, also decimating the western part of the island. However, in 1922, construction began on the new lighthouse. The light helps in navigation and also serves as the housing facility for the United States Coast Guard. Tourists will enjoy the scenic views which are accessible from the spot which house the ruins. Take photographs of the beautiful ruins. Take Route 107 North to reach the spot. Take a stroll on the Borinquen Beach. Pay a visit to the nearby Aguadilla Golf Course. 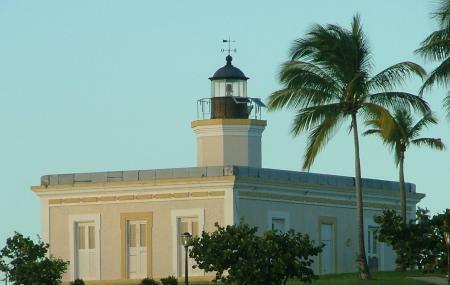 How popular is Punta Borinquen Lighthouse? People normally club together Old Aguadilla Lighthouse Ruins and Las Cascadas Water Park while planning their visit to Punta Borinquen Lighthouse. The best place to camp or hang with the family in a very relax atmosphere. Beautiful spot for swimming, camping, walking, snorkeling, running, etc. People have seen whales around the area and hawksbill turtles. It is not so crowded like other beaches, this can be good or bad. During weekends there are more people coming. Near of this, there's a a surfers beach, if you keep walking to the left, also you can find the old lighthouse structure. The area it's not always full of people, that's why if you are alone in the week it's not very safety, it is a very huge place. If you decide to go, be aware and very careful. There are parts where there's no more road. Es una playa grandiosa, limpia, cristalina, espectacular.